For the biome in north-western Europe, see North Atlantic moist mixed forests. The Atlantic Forest (Portuguese: Mata Atlântica) is a South American forest that extends along the Atlantic coast of Brazil from Rio Grande do Norte state in the north to Rio Grande do Sul state in the south, and inland as far as Paraguay and the Misiones Province of Argentina, where the region is known as Selva Misionera. The Atlantic Forest has ecoregions within the following biome categories: seasonal moist and dry broad-leaf tropical forests, tropical and subtropical grasslands, savannas, and shrublands, and mangrove forests. The Atlantic Forest is characterized by a high biodiversity and endemism. It was the first environment that the Portuguese colonists encountered over 500 years ago, when it was thought to have had an area of 1,000,000–1,500,000 km2 (390,000–580,000 sq mi), and stretching an unknown distance inland. Over 85% of the original area has been deforested, threatening many plant and animal species with extinction. Seasonal tropical moist forests may receive more than 2000 mm of rain a year. These include Tropical Moist: Lowland Forests, Submontane Forest, and Montane Forests. Further inland are the Atlantic dry forests, which form a transition between the arid Caatinga to the northeast and the Cerrado savannas to the east. These forests are lower in stature; more open, with high abundance of deciduous trees and lower diversity when compared to tropical moist forests. These forests have between 700–1600 mm of precipitation annually with a distinct dry season. This includes Deciduous and Semideciduous Seasonal Forest each with their own lowland and montane regions. Montane forests are higher altitude wet forests across mountains and plateaus of southern Brazil. The Mussununga forests occur in southern Bahia and northern Espirito Santo states. The Mussununga ecosystem ranges from grasslands to woodlands associated with sandy spodosols. The word Mussununga is Amerindian Tupi-Guarani meaning soft and wet white sand. The Atlantic Forest is unusual in that it extends as a true tropical rain forest to latitudes as far as 28°S. This is because the trade winds produce precipitation throughout the southern winter. In fact, the northern Zona da Mata of northeastern Brazil receives much more rainfall between May and August than during the southern summer. The geographic range of Atlantic Forest vary depending on author or institution that published them. Information on four most important boundaries as well as their union and intersection was reviewed in 2018. Despite having only 28% of native vegetation cover remaining, the Atlantic Forest remains extraordinarily lush in biodiversity and endemic species, many of which are threatened with extinction. Approximately 40 percent of its vascular plants and up to 60 percent of its vertebrates are endemic species, meaning they are found nowhere else in the world. The official threatened species list of Brazil contains over 140 terrestrial mammal species found in Atlantic Forest. In Paraguay there are 35 species listed as threatened, and 22 species are listed as threatened in the interior portion of the Atlantic Forest of Argentina. Nearly 250 species of amphibians, birds, and mammals have become extinct due to the result of human activity in the past 400 years. Over 11,000 species of plants and animals are considered threatened today in the Atlantic Forest. The incorporation of modern human societies and their needs for forest resources has greatly reduced the size of the Atlantic Forest, which has resulted in species impoverishment. Almost 88% of the original forest habitat has been lost and replaced by human-modified landscapes including pastures, croplands, and urban areas. This deforestation continues at an annual rate of 0.5% and up to 2.9% in urban areas. Another strategy being implemented to maintain biodiversity within the Atlantic Forest is creating wildlife corridors. The World Bank is donating $44 million to create a corridor, which will be known as the Central Biodiversity Corridor, in the Atlantic Forest and one in the Amazon. The Brazilian Development Bank has been financing, with non-reimbursable loans, 16 to 18 ecosystem restoration projects totaling 3,500 hectares and costing approximately $22 million under the so-called Iniciativa BNDES Mata Atlântica. 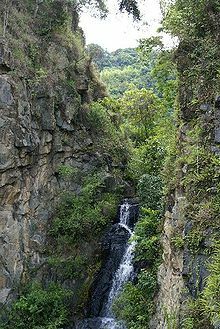 In order to preserve diversity, the state of Sao Paulo has created the Restinga de Bertioga State Park, a 9.3 thousand hectares park which also serves as a wildlife corridor linking the coastal regions to the Serra do Mar mountain range. Some organizations, such as the Nature Conservancy, are planning to restore parts of the forest that have been lost and to build corridors that are compatible with the lifestyles of the native people. The Amazon Institute is active in reforestation efforts in the northeastern state of Pernambuco, Brazil. During 2007, Joao Milanez and Joanne Stanulonis have planted 5,500 new trees in the mountains commencing with Gravata, adding to the precious little, ancient forest left. The Pontifícia Universidade Católica do Rio Grande do Sul keeps a private reserve of the Araucaria moist forest ecoregion of approximately 3.100 ha called Pró-Mata, near the city of São Francisco de Paula in the state of Rio Grande do Sul. This reserve is used for research and biodiversity conservation. ^ "The Atlantic Forest". The Nature Conservancy. ^ "Atlantic Forests, South America". WWF. ^ a b c d Thomas, William Wayt, and Elizabeth G. Britton. 2008. The Atlantic coastal forest of Northeastern Brazil. Bronx, N.Y.: The New York Botanical Garden Press. ^ a b c d Galindo Leal, Carlos, and Ibsen de Gusmão Câmara. 2003. The Atlantic Forest of South America: biodiversity status, threats, and outlook. Washington: Island Press. ^ Saporetti-Junior et al 2011. ^ Muylaert, Renata Lara; Vancine, Maurício Humberto; Bernardo, Rodrigo; Oshima, Júlia Emi Faria; Sobral-Souza, Thadeu; Tonetti, Vinicius Rodrigues; Niebuhr, Bernardo Brandão; Ribeiro, Milton Cezar (2018-09-11). "UMA NOTA SOBRE OS LIMITES TERRITORIAIS DA MATA ATLÂNTICA". Oecologia Australis (in Portuguese). 22 (3): 302–311. doi:10.4257/oeco.2018.2203.09. ISSN 2177-6199. ^ Rezende, C.L. ; Scarano, F.R. ; Assad, E.D. ; Joly, C.A. ; Metzger, J.P.; Strassburg, B.B.N. ; Tabarelli, M.; Fonseca, G.A. ; Mittermeier, R.A. (October 2018). "From hotspot to hopespot: An opportunity for the Brazilian Atlantic Forest". Perspectives in Ecology and Conservation. 16 (4): 208–214. doi:10.1016/j.pecon.2018.10.002. ISSN 2530-0644. ^ Tabarelli, Marcelo; José Maria Cardoso Da Silva & Claude Gascon (June 2004). "Forest Fragmentation, Synergisms and the Impoverishment of Neotropical Forests". Biodiversity and Conservation. 13 (7): 1419–1425. doi:10.1023/B:BIOC.0000019398.36045.1b. ^ a b IIzquierdo, Andrea E.; Carlos D. De Angelo & T. Mitchell Aide (2008). "Thirty Years of Human Demography and Land-Use Change in the Atlantic Forest of Misiones, Argentina: an Evaluation of the Forest Transition Model". Ecology and Society. 13 (2): 3. (online). ^ a b c d Biodiversity Hotspots - Atlantic Forest - Conservation Action Archived March 23, 2012, at the Wayback Machine. Biodiversity Hotspots - Home. 03 Oct. 2011. Saporetti-Junior, Amilcar Walter; Schaefer, Carlos Ernesto G. Reynaud; de Souza, Agostinho Lopes; Soares, Michellia Pereira; Araújo, Dorothy Sue Dunn; Meira-Neto, João Augusto Alves (21 September 2011). "Influence of Soil Physical Properties on Plants of the Mussununga Ecosystem, Brazil". Folia Geobotanica. 47 (1): 29–39. doi:10.1007/s12224-011-9106-9. 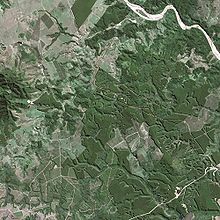 Wikimedia Commons has media related to Atlantic Forest. Wikimedia Commons has media related to Mata Atlântica.